The NASA/ESA Hubble Space Telescope has observed the variable star RS Puppis over a period of five weeks, showing the star growing brighter and dimmer as it pulsates. These pulsations have created a stunning example of a phenomenon known as a light echo, where light appears to reverberate through the murky environment around the star. For most of its life, a star is pretty stable, slowly consuming the fuel at its core to keep it shining brightly. However, once most of the hydrogen that stars use as fuel has been consumed, some stars evolve into very different beasts — pulsating stars. They become unstable, expanding and shrinking over a number of days or weeks and growing brighter and dimmer as they do so. 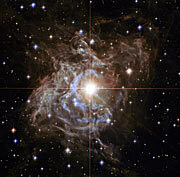 A new and spectacular Hubble image shows RS Puppis, a type of variable star known as a Cepheid variable . As variable stars go, Cepheids have comparatively long periods. RS Puppis, for example, varies in brightness by almost a factor of five every 40 or so days. 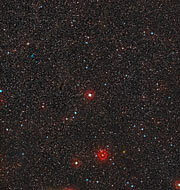 RS Puppis is unusual as it is shrouded by a nebula — thick, dark clouds of gas and dust. Hubble observed this star and its murky environment over a period of five weeks in 2010, capturing snapshots at different stages in its cycle and enabling scientists to create a time-lapse video of this ethereal object (heic1323a). The apparent motion shown in these Hubble observations is an example of a phenomenon known as a light echo . The dusty environment around RS Puppis enables this effect to be shown with stunning clarity. As the star expands and brightens, we see some of the light after it is reflected from progressively more distant shells of dust and gas surrounding the star, creating the illusion of gas moving outwards. This reflected light has further to travel, and so arrives at the Earth after light that travels straight from star to telescope . This is analogous to sound bouncing off surrounding objects, causing the listener to hear an audible echo. While this effect is certainly striking in itself, there is another important scientific reason to observe Cepheids like RS Puppis. 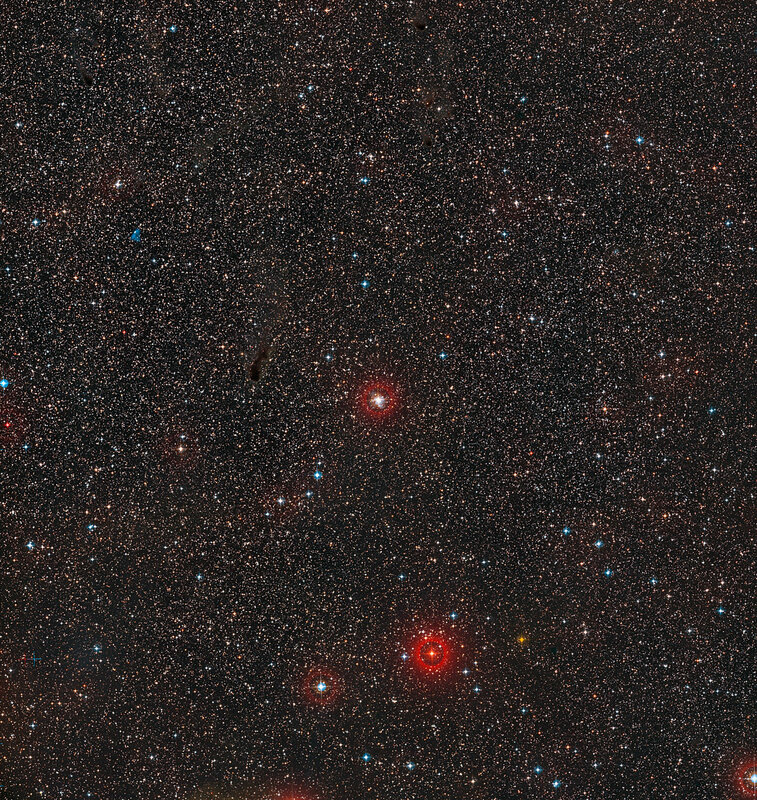 The period of their pulsations is known to be directly connected to their intrinsic brightness, a property that allows astronomers to use them as cosmic distance markers. A few years ago, astronomers used the light echo around RS Puppis to measure its distance from us, obtaining the most accurate measurement of a Cepheid's distance (eso0805). 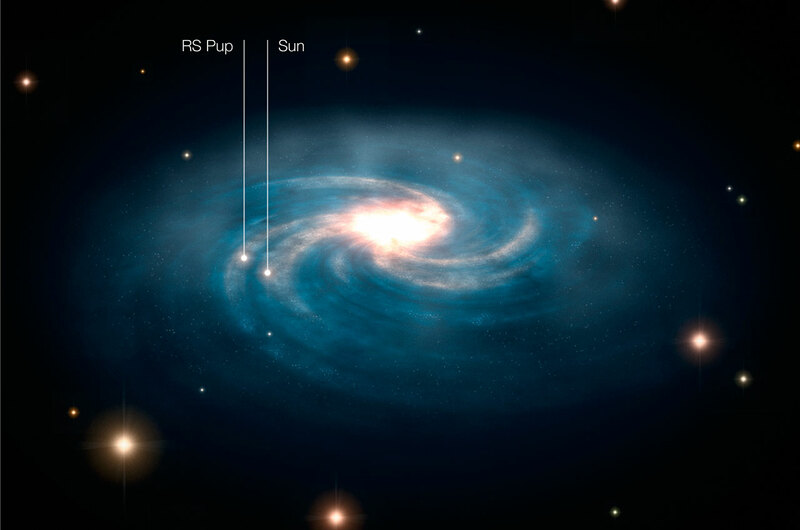 Studying stars like RS Puppis helps us to measure and understand the vast scale of the Universe. RS Puppis is over ten times more massive than our Sun, and around 15 000 times more luminous. It lies around 6500 light-years away from us. This light echo enabled astronomers to measure the distance to RS Puppis very accurately back in 2008. This measurement is the most accurate ever calculated for a Cepheid. This effect can make it appear that this propagation of light is happening at speeds greater than the speed of light, but this is just an illusion.